We’ve mentioned on here in the past that generally speaking, real estate increases in value over the long term. But the obvious truth is, there is a lot of money to be lost in real estate as well. It’s critical that you begin investing in real estate using KNOWLEDGE not speculation. 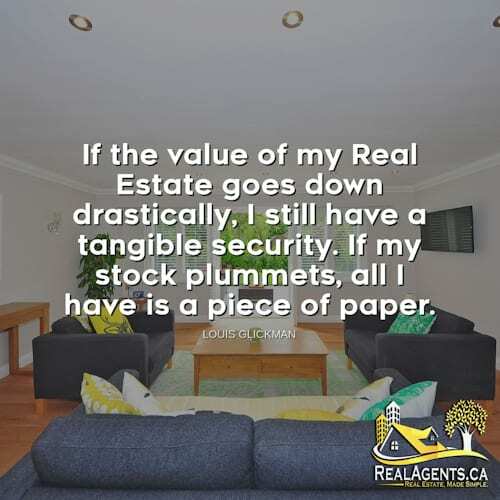 That’s why its essential you partner with a great REALTOR®. Typically when investing in real estate you want to focus on BMV (Below Market Value) properties, and this will reduce your risk dramatically, but if you are buying in a market that has been stable over the past number of years and the community you live in is stable economically you will likely be okay. What Louis Glickman is saying here is that in the worst case scenario that the market tanks completely, at least you still have a tangible asset and not just a piece of paper saying that you have nothing left to your name. Real estate investing isn’t for everyone, but it can make a dramatic difference in your cash flow if you are prudent and use knowledge, not speculation or emotion. Louis J. Glickman, a widely known real estate investor and philanthropist, died on Friday at New York Hospital. He was 94 and lived on the Upper East Side. Mr. Glickman formed a Manhattan-based real estate investment company in 1942 and was widely active in real estate investments in the United States and Canada. One of his best-known deals was not completed. In 1956, he made it known that he had arranged to buy Carnegie Hall and planned to tear it down and replace it with a 40-story office building. Demolition was to begin when the Philharmonic-Symphony Society’s lease expired in 1959. But Mr. Glickman later dropped his option to buy the building, and it was unclear whether a Save Carnegie Hall campaign or an inability to finance the project on profitable terms led to his backing out. The building was eventually preserved.